Thank you for your interest in my work. However, this blog is no longer active and messages are not being monitored. Please visit my website www.conservationphotojournalism.com to view my work and to contact me. Follow me on Twitter or Facebook for updates on projects or news about upcoming talks, events and tours. I am the 2014 European Wildlife Photographer of the Year! It’s with humility and immense pride that I can announce that my photograph ‘Living Rock Art‘ has won me the overall title of 2014 GDT European Wildlife Photographer of the Year. I was in South Africa working on a story about the rhino poaching crisis and one particular rhino named Thandi that had survived a brutal attack by poachers. I think I had photographed Thandi from every possible angle so my guide – and now good friend – Brendon Jennings and I decided to take a break and explore the floodplains of the Bushman’s River. 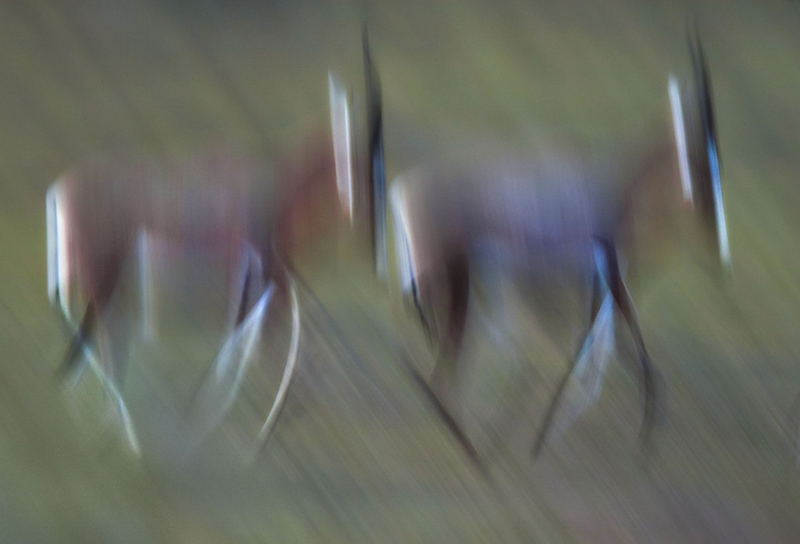 That’s when we found the herd of blesbok. My ankle had turned in a hole. I landed in a heap in the dust. The pain was unbelievable but, fortunately, I had somehow planted my tripod and camera safely as I fell. I was able to sit up just in time to see the blesbok approaching. I grabbed my camera, locked my focus on them and panned smoothly as they careered past. Only once they had disappeared in a cloud of dust did I turn my attention to my injuries. My fall may have been but the picture was no accident. It won’t be everyone’s cup of tea, I know that, but I was working hard to capture their movement in a still photograph. What I hadn’t banked on was that the shapes created by their striking black and white leg markings would so closely resemble Bushman rock art, which influenced the title of the image. I collected my prize in Lunen, Germany at a ceremony marking the competition’s 14th year surrounded by incredibly talented photographers that I have nothing but respect for…which makes this win all the more special. I’m pleased to say that my success in the competition was not just restricted to Africa’s plains. 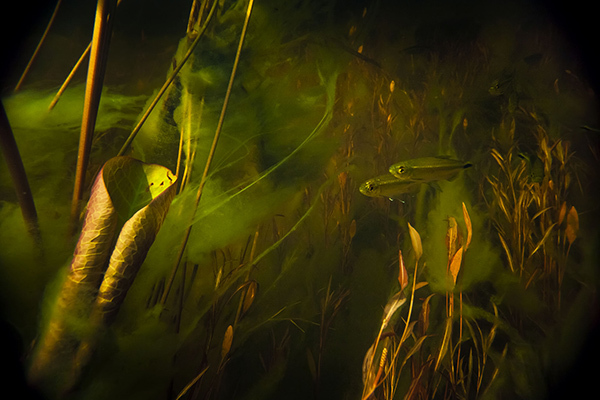 My photograph of a shoal of tiny Okavango robber fish swimming up the Selinda Spillway in northern Botswana was selected as Highly Commended in the Underwater category too. Join me in Cape Town on Saturday 15 November for the Wild Shots Wildlife Photography Symposium. I am fortunate to be taking the stage alongside leading editors and fellow photographers to deliver an exciting line up of talks and workshops at the University of Cape Town’s Percy Fitzpatrick Institute. In my talk Putting images to good use – picture power for conservation, I will be using some of my photo stories from Africa and Europe to show the importance and power of conservation photography. Other speakers include reigning Wildlife Photographer of the Year Greg Du Toit, editor Sophie Stafford of BBC Wildlife and WWF Action magazines, fellow photographer Morkel Erasmus and Sam Reinders, photography editor at South Africa’s Go! Magazine. A website is generally one of those things that is never quite finished, never quite right. I’ve had a picture in my head for some time of how I want my website to look and an idea of how I want it to work for me – a fine balance of doing justice to the pictures I invest so much in taking and making it easy for my audience to navigate around, interact with me and find the information they’re after. You may notice that the new website launch also comes at the same time as a new brand. I hope you like the rhino. I’ll be honest, it started as a doodle during a really boring conversation but I couldn’t think of a more poignant and iconic species to have incorporated into my branding than a rhino, so I developed it from there. Anyway, have fun browsing the new site. Do let me know what you think about it or the new brand via the contact page on the site.